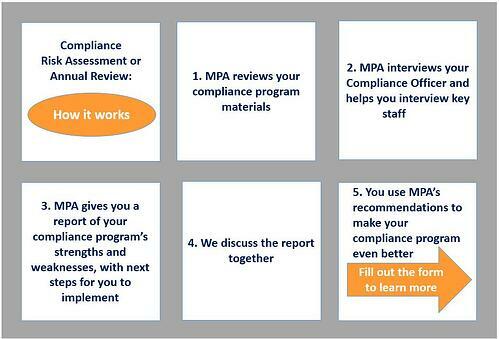 Fill out the form to receive more information about MPA's Compliance Risk Assessment. On November 28, 2019, all skilled nursing facilities will be required by law to conduct an annual review of their compliance programs. While we don’t know how this will be enforced, we do know that providers who have not conducted an annual review by November 28, 2019 will be in violation of the law. Providers have been on notice of this requirement since the regulation was released in 2016. “Annual Review,” “Compliance Program Risk Assessment,” and “Compliance Program Effectiveness Review” all mean the same thing: A comprehensive evaluation of the compliance program. The review evaluates each element of compliance and each risk area, identifies gaps, and includes a plan of action to close those gaps. MPA believes the Annual Review is essential to moving compliance forward, and for giving Boards a yardstick by which to measure the compliance programs they oversee. Please fill out the form on your left to learn more.